Seymour Hersh has been the most important, famous and controversial journalist in America for the last three decades of the twentieth century and the early part of this century. From his exposé of the My Lai massacre in Vietnam in 1969 to his revelations about the prison torture at Abu Ghraib in 2004, the mercurial Hersh, now 76 years old, has consistently captured the public imagination, spurred policymakers to reform, and drawn the ire of Presidents. Three of his eight books have been best sellers; all of them have caused heated controversy. And he has won virtually every prize in American journalism on his way to earning a reputation as the best investigative reporter in the country and becoming an icon of American journalism. Beyond all that, he is a colorful character – a rebel who upsets apple carts and speaks his mind while butting heads with the establishment. Hersh once commented, “I like to write stories that make people jump up and down.” And he has been doing that for 50 years. In fact, he is still doing it in long installments in The New Yorker magazine where he has regularly contributed articles since 1991. Those articles have made him into the man who the country looks to for one of the few unvarnished and behind-the-scenes views of the war in the Middle East. Hersh’s personality and personal story are as colorful and compelling as his career. He is a larger- than-life American character. “I’m a little bit of a madman I guess,” he once commented. The son of Eastern Europeans who grew up around his father’s dry cleaning store in Chicago, Hersh is a maverick whose careful reporting has helped shape American public policy. But he is also the brash outsider who pierces the inside, the iconoclast who delivers his attacks while working for the establishment. Hersh’s reporting career has touched on all aspects of the newsgatherer’s life – from the Associated Press to the New York Times to The New Yorker to award-winning books. And at every stop along the way, Hersh has found success, celebrity and controversy. As a free-lancer he uncovered one of the biggest stories of the Vietnam era, but received fierce criticism. When he worked in the newsroom of the staid Times, he wore old tennis shoes and frayed shirts but produced scoop after scoop like the Times had never seen. This included stories that changed the shape of the American intelligence community and jump-started the Watergate investigation when Woodward and Bernstein were stymied. His magazine article on Richard Nixon’s pardon of Gerald Ford raised fresh questions on whether a deal was cut to avoid prison time for Nixon. And his books on Henry Kissinger’s “war crimes” and John Kennedy’s libido made headlines across the nation as their defenders struck back against Hersh’s revelations. In the meantime his legend spread in the journalism world as he bartered and blustered with his secret sources to induce them to talk, threatening to expose a Senator’s mistress if he did not talk and trading information with the director of the CIA in order to get stories. He is legendary for his ability to get sources at the highest levels of government and in the most sensitive agencies – the CIA, the Pentagon, and the FBI – to talk to him. Hersh began as a copy boy with the City News Bureau in Chicago, a raucous introduction to journalism that was the model for the “The Front Page” movies. After briefly running his own community newspaper, he worked for the Associated Press. While a correspondent for the AP in Washington, D.C. he became disgusted with the regimented way the capitol press corps stuck to official briefings. Instead he wandered the halls of the Pentagon seeking out sources. His maverick status was underway. And then in 1967 he left the AP when it refused to print his first major scoop – that the United States was stockpiling and preparing to use chemical and biological weapons. For three months in 1968 Hersh crossed over into public relations when he became the chief spokesperson and speechwriter for Democrat Eugene McCarthy in his fabled run as an anti-war candidate seeking to unseat Lyndon Johnson. Hersh left in a dispute with McCarthy over his stand on integration. But doing PR, even for an admirable candidate, was an aberration for Hersh. He was a born reporter. Acting on a tip from a source, Hersh dug into the story that would make him famous – the massacre of nearly 500 women, elderly people and children, all civilians, in the hamlet of My Lai in Vietnam. Hersh chased down and won over the officer accused of overseeing the shootings, Lt. William Calley. He told Hersh the whole story, painting a gruesome and detailed picture of the massacre. After having trouble finding an outlet, he pieced together a newspaper syndicate to publish the story. Hersh was vehemently attacked by people who felt the story could not be true; others felt it should not have been written at all. But Hersh was awarded the Pulitzer Prize for international reporting, making him a cult hero to this day in lectures across the nation’s college campuses. In 1972 Hersh joined the New York Times, which was in desperate need of a star investigative reporter and lagging behind the Washington Post in its Watergate coverage. Hersh worked for the Times in Washington and New York for the next seven years, breaking some of the biggest stories of the tumultuous era. His reporting caused policy upheavals in regards to Vietnam, government spying and secrecy and Watergate. His most important reporting coup came when his secret sources in the intelligence community allowed him to reveal that the CIA was illegally opening the mail of thousands of American citizens. After two congressional investigations, the agency’s charter was dramatically altered. The Nixon Administration began discussing how to stop Seymour Hersh. Hersh left the Times primarily to write books – but especially to follow-up on what he had begun to suspect about Secretary of State Henry Kissinger. He had concluded that Kissinger had seriously abused his authority and caused thousands of unnecessary deaths. His 1983 book, The Price Power: Kissinger in the Nixon White House, based on more than a thousand interviews, was an award-winning best seller and a frontal attack on Kissinger whose supporters furiously attacked Hersh’s credibility, his use of secret sources, and his alleged leftist bias. The Price of Power marked the culmination of the political right’s hatred for and venomous attacks on Hersh’s reporting, attacks that continue unabated today. The Price of Power cost Hersh thousands of dollars to research and when it was done, he was broke. He set out on the college lecture circuit again, packing auditoriums throughout the nation. And he also turned his attention to more books. First came his detailed and startling inside account of how the Soviet Union had mistakenly shot down a Korean Airliner with 269 civilians aboard as the Soviet government played Cold War games with the United States. The real villain, he charged, was U.S. intelligence which allowed, if not prompted, the shootdown. The book’s charges again made headlines. Similarly, his next book, about how Israel had secretly developed a nuclear arsenal, stirred diplomatic controversy with its allegations that the U.S. looked the other way as Israel developed a nuclear stockpile. He charged also that British media magnate Robert Maxwell was an Israeli spy and that Israeli prime ministers passed on U.S. secrets to the Soviet Union. Maxwell sued him. No one, it seemed, was better at penetrating the hidden workings of government at its highest levels than Hersh. But once more his charges brought criticism that his sourcing was suspect and his scholarship faulty, a criticism that has dogged him. In 1991 Hersh became officially affiliated with the New Yorker, the most important magazine in the nation for intellectuals and the elite establishment. He continues to contribute long articles, mostly on national security and intelligence-gathering issues. The articles have caused widespread comment and, according to the magazine’s editor, have pushed the New Yorker’s circulation from over the million mark. “I keep insisting we ought to rename the magazine the Seymour M. Hersh weekly reader,” Hersh commented recently. At the New Yorker he has been given plenty of time and space to explore the machinations of government but especially the intelligence community. As usual his reporting has caused at least three huge controversies. In 2001 he charged in a 25,000-word article that soldiers under the command of General Barry McCaffrey massacred scores of Iraqi troops two days after a cease-fire went into effect. McCaffrey fired back in denial. The fury of the Bush Administration toward Hersh peaked in April of 2004. That is when Hersh revealed to a startled nation that Iraqi prisoners at a prison in Abu Ghraib were the objects of torture and abuse at the hands of U.S. Army soldiers. Photographs which Hersh had uncovered and seen followed on television and in national magazines. The articles helped launch a dozen different criminal investigations. Thus far, forty-five soldiers have been recommended for courts-martial and 23 others for summary discharge. Thirty-five years after My Lai, Hersh was back on top, reporting again on an American atrocity. For Hersh Abu Ghraib was not the equivalent of My Lai. But it was torture and it did stem from clear policy decisions made by the Bush Administration. For Hersh it spoke to the lack of morality – once again – from the highest levels of the American government. The Bush Administration, he charged, is composed of a small group of “neoconservatives, cultists ….They’ve taken the government over.” As for the current war in the Mideast, “Even if we have another thousand body bags, it won’t deter” Bush. “It scares the hell out of me,” Hersh says. Sy Hersh, the dry cleaner’s son, at the age of 76, is still indignant, still in the eye of the storm – and still America’s greatest and most controversial reporter. The story of the “Scoop Artist” is told now in Robert Miraldi’s new biography. 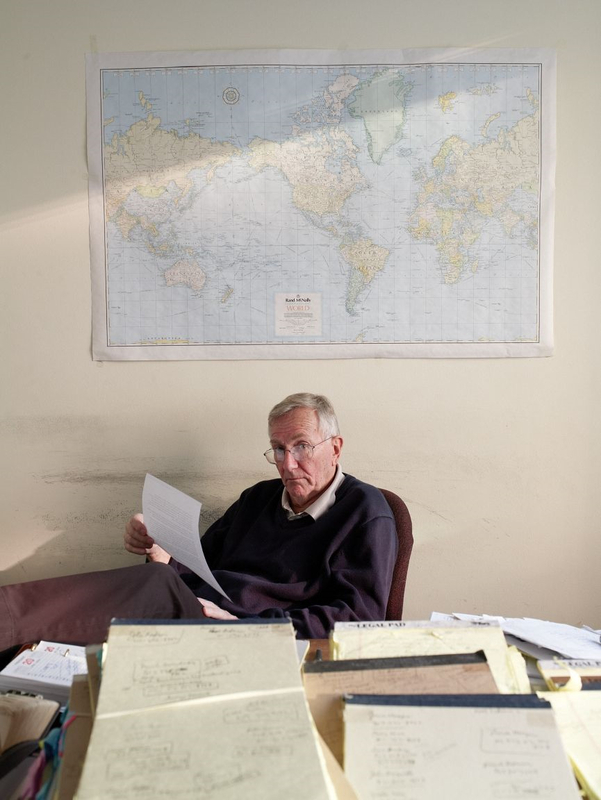 For the complete collection of work from Seymour Hersh, see the Hersh Bibliography.